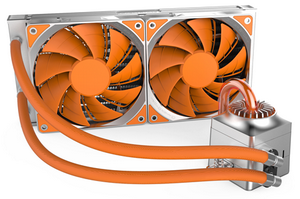 " Deepcool's Captain 240EX RGB is a closed loop liquid CPU cooler with a high performance pump, 240mm radiator and DEEPCOOL efficient dual blade fans.Today Deepcool launches TR4 version, it is compatible with a wide range of CPU types allowing users to integrate all the current releases from Intel and AMD into their rigs – including the new TR4 socket for the latest AMD RYZEN Threadripper processor. Captain 240EX RGB is equipped with an integrated RGB lighting system that can be controlled via a cable connected controller or with software and a motherboard header as part of a wider illuminated system. The Electro Limited Edtion is a stylish new addition to the existing choice of Black or White themed versions and will be available in May, 2018"